It's June, 1956, and school's just about out for the summer. Teenage Nora and her friends have a party with a few boys, dance, hang out and drink too many beers. 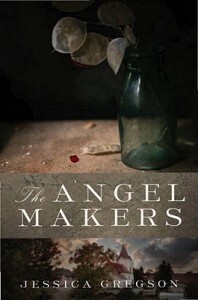 But none of them can imagine that their lives are about to change forever because of a shocking murder. The next day, the bodies of two of the girls from Nora's group, Cheryl and Bobbi Jo, are found shot to death in the woods near their house. Everyone thinks that Buddy, Cheryl's ex-boyfriend, who looks like an imitation of James Dean, must be guilty of the brutal crime. But when no conclusive evidence is uncovered, he's released by the police, although everyone in the town still assumes he did it, and worse yet, that he got away with it. 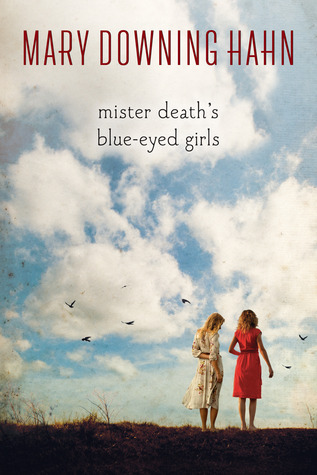 This excellent mystery, written from the point of view of Nora, her friend Ellie, Buddy, and the actual guilty murderer, takes place in a time that seems so innocent now--a time of listening to Elvis records with your girlfriends, worrying what would happen if a boy touched your knee, and having ice cream sodas at the neighborhood drugstore. But with the murders life changed for all the teens in the story. What would it be like to have your friends murdered, begin to question not only your Catholic faith, but your very belief in God, and not know how to go on living? And what if everyone in town thought you were a murderer? This is different from other Mary Downing Hahn books I've read--not a ghost story, but a story nonetheless of how the dead can haunt us in other ways. It's a coming-of-age story as well as a mystery and a real page turner. Highly recommended. Note: the novel is inspired by a similar crime which took place when the author was a teen; the author knew both girls who were the victims and remembers vividly being at a friend's house when the bodies were discovered. She writes in an afterword that the event has haunted her for years. Young Alice Coachman, growing up in segregated Albany, Georgia, in the 1930's, just couldn't help herself. She wanted to soar and touch the sky. 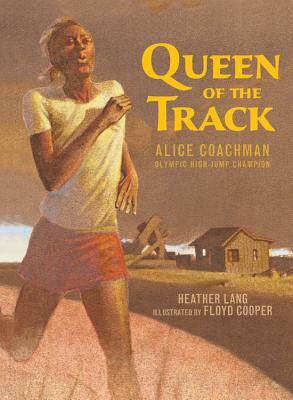 "Bare feet shouldn't fly./Long legs shouldn't spin./Braids shouldn't flap in the wind./'Sit on the porch and be a lady,' Papa scolded Alice," this book about the future Olympic athlete begins. When she watched boys doing the high jump at a track meet, "Alice's feet tingled, wanting to try." We see Alice's dreams growing bigger as she gets older, until finally the high school coach needed a jumper for a track and field tournament in Alabama. Her family was too poor to afford proper clothes for the competition, so her teachers pitched in and bought her shoes, shorts, and bright white socks. For the first time, she competed with the best black athletes in the South. 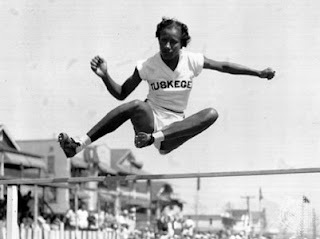 In 1939, she won her first national medal, and soon she was asked to enroll at Tuskegee, where she'd be able to train with the best. Alice worked hard to pay her school fees. Alice dreamed of the Olympics, but with the world consumed by war there were no games to enter. Could she still compete in 1948? 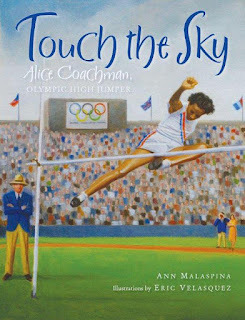 Would she achieve her dream of a gold medal in the high jump--and finally touch the sky? Written in a simple yet poetic style, this book captures the spirit of a true American heroine and a pioneer in sports, one who is not widely known today. It's a real "girl power" story, as well as a tale about overcoming prejudice. The stunning large format oil paintings, by illustrator Eric Velasquez, with their vibrant colors and sweeping compositions, capture the intensity of Alice's story, and especially of her jumping. An author's note shows photographs of the real Alice and her teammates and tells about what happened to Alice after her triumph at the Olympics. A bibliography is also included. When it rains, it pours, and another picture book about this outstanding athlete will be released later this month. Queen of the Track: Olympic Champion Alice Coachman, is published by Boyds Mills press. It's written by Heather Lang and illustrated by Floyd Cooper. GIVEAWAY: Would you like to know more about Touch the Sky and win a copy of this book and other women's history picture books? Check out Ann Malaspina's post at Kidlit Celebrates Women's History Month and leave a comment to enter. Her mother refuses to accept "the hissing doctor's verdict," and gives her daughter a book--a blank diary, or is it "an ordinary/schoolbook/filled with frog-slippery/tricky letters/that know how to leap/and escape?" She tries to patiently write in her blank book each night, her "wild diary," and wonders how reading can look so easy, yet be so impossible? Will her wild book "ever seem tame?" She struggles on with her reading, reading slowly to sound out the words. What good can come of this word blindness? In a surprising twist, Fefa's careful powers of observation with the written word will end up helping to save her family from danger. 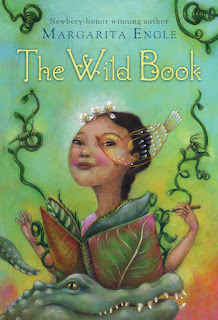 Engle's spare verse captures so eloquently 11 year old Fefa's frustration and yet fascination with words, reading, and writing, as well as the Cuba of yesteryear, a time when bandits roam the land, kidnapping children and holding them for ransom. The pages of the book are nearly as blank as the pages in Fefa's wild book, with the narrative told with few words but memorable poetic images. Fefa lives in the countryside on a farm, where her many sisters and brothers tease her and on her Sunday outings to town she strolls around the plaza with her cousin, while "girls just daydream/and smile." With a mama who loves poetry, words are a part of their every day family life, with her mother reading poetry out loud, and fairy tales filling Fefa's head. The poems are full of tiny details of the family's life in Cuba, such as making jewelry out of reeds from the river, and roasting a whole pig in a pit for a feast. While this story deals with a serious learning disability, there is hope in the end for Fefa. This would be an excellent choice to read out loud with a child, which would allow the reader to hear the beauty of the verses and to discuss the story as well. Susanne Dunlap is a favorite author of mine for YA historical fiction with a romantic flair, books that will realistically appeal much more to girls than to boys. This is her fourth YA title (she has also written historical fiction aimed more at adults) and the first set in France. In this new novel, Eliza, the young daughter of future U.S. President James Monroe, is in France with her mother, where she is left behind in a chic boarding school just outside the city that's run by a former courtier to Marie Antoinette, Madame Campan. The school is attended by France's finest young ladies, including Caroline Bonaparte, the youngest sister of the up-and-coming French general, as well as Hortense Beauharnais, the daughter of Napoleon's wife, Josephine. The book is set in the turbulent year 1799, the year in which Napoleon overthrew the French Directory and took power for himself as First Counsel, leading of course to his eventually crowning himself Emperor (although not in the course of this novel). The book alternates between four different narrators: Eliza, Hortense, Caroline, and Madeleine, the mixed-race--and of course entirely unsuitable--daughter of a cruel, drug-addicted Paris actress. Eliza quickly picks up on the bad blood between Hortense and Caroline at school, wondering what role she will play in the school's hierarchy of students. All the girls seem much more concerned with their love lives than any studying, not too surprising since their primary curriculum seems to be learning how to talk prettily to young gentlemen, including the lads from the nearby boys' school who sometimes visit for training exercises. But the school's far from boring. There seems to be plenty of intrigue, with Caroline whisking innocent young Eliza off to a clandestine party in Paris when they're supposed to be asleep in bed. All the girls develop crushes on the wrong sort of man--Hortense on a music teacher, Caroline on a general that her brother doesn't want her involved with, and both Eliza and Madeleine, the actress' daughter, on Hortense's handsome brother, Eugene. Will anyone wind up with the man of their dreams? You'll have to read on to the shocking ending to find out. And in the middle of all of this romantic drama, there's a political drama behind the scenes, a possible coup, one that the girls are determined to witness, even dressing up as soldiers to sneak off and see what's going on. Not to mention Eliza's trying to come to terms with her racial attitudes from growing up with slaves on a Southern plantation. Although I greatly enjoyed The Academie, I can't say it's my favorite of Dunlap's novels. I found it occasionally confusing switching back and forth between the different narratives, and I found it hard to suspend my disbelief at some of the girls' dangerous antics, which seemed a bit far fetched for young girls in this setting. An author's note explains that while all three of her main characters (Eliza, Hortense, and Caroline) indeed attended the same boarding school, they were probably not all three there at the same time and the author admits to taking some liberties with the actual timeline in structuring her story. Nonetheless, the real Eliza and Hortense remained friends and Eliza even intended Napoleon's coronation as emperor in 1804. And the rivalry between Napoleon's family and Josephine and her children is a well-established historical fact. 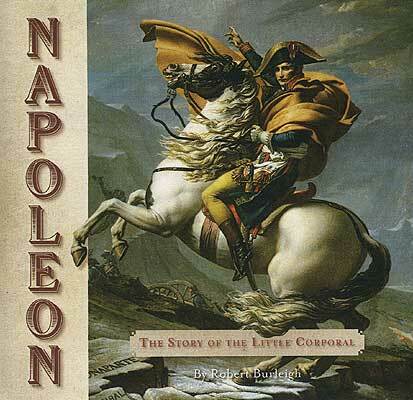 This novel is set at a time period we don't see portrayed much in historical fiction--after the French Revolution, but before Napoleon fully takes power. For that reason alone, I would recommend this book. 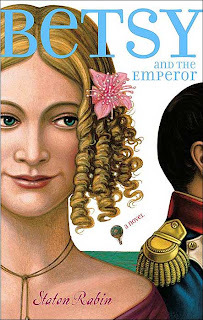 I think young people, particularly girls, will enjoy the romance and political intrigue that Dunlap skillfully portrays in this school setting so different from today. Teens might also enjoy Betsy and the Emperor, by Staton Rabin (Margaret K. McElderry, 2004), which tells the story of a young girl who gets to know the famous man while he is a prisoner on St. Helena. HARD TO BELIEVE, BUT TRUE: I was stunned to read in the LA Times (see link below) recently that there are plans afoot in France to make a Disneyland-like theme park based on Napoleon, complete with snowy battle re-enactments and a ride on Napoleon's hat. What will be next? An amusement park with a pretend guillotine where you get your head cut off and then reattached??? 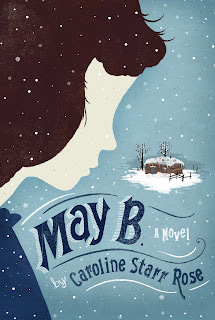 Author Caroline Starr Rose describes her striking debut novel in verse for middle grade readers as "part Hatchet, part Little House on the Prairie, part Out of the Dust. It's a story of courage and hope." Set on the Kansas frontier, this novel tells the story of May, who's just twelve years old when her pa pulls her out of school and hires her out to a couple who've recently moved out to the endless Kansas prairies. "I won't go," is the book's poignant first line, but of course she has no real choice, in the way of all children in that era. She'll bring in some extra money for her family, and it will just be until Christmas, her ma promises her. May hopes to be a schoolteacher one day, a surprising goal given that she has trouble learning at school. "What sort of teacher can't read out lessons?" she wonders. Yet she perseveres, bringing a book and her slate with her. When the couple she's sent to live with leave her alone in their sod house, at first she's sure they'll be returning. But when the days pass, she realizes she's been left to fend for herself, miles from any other settlers and with no help in sight. With the harsh Kansas winter coming, she must find food and fuel if she's to survive, summoning every bit of her courage and knowledge to make it through alive. I particularly enjoyed the author's use of free verse in this short novel, which is accessible to even reluctant readers. The author's poetry is particularly evocative in describing the vastness of the Kansas prairies: "grass/always grass,/in different shades and textures/like the braids in a rag rug." This novel deals with several different themes; on the one hand it is an exciting survival/adventure story, much in the spirit of books like Hatchet, in which May must survive on her own, with no adults to help her. The author also portrays the harsh realities of life on the prairie for settlers, a less warm and fuzzy environment than what we'd encounter in classics such as the Little House series. Moreover, May B. is also a poignant story of a child trying to overcome a disability; in this case dyslexia. Of course no one understood dyslexia at that time, and often children with this disability were simply seen as stupid or not trying hard enough. We see one teacher, Miss Sanders, who's sympathetic to May and doesn't force her to read aloud, and another, simply known as "Teacher," who humiliates her by seating her with the youngest children. May B. received starred reviews from Publisher's Weekly and Kirkus. It's an excellent historical fiction choice for upper elementary and middle school students. A study guide for May B. is available here. Set in a small Hungarian village around World War I, this "can't put it down" adult historical fiction novel centers around a teenaged girl, Sari, who's orphaned and left in the care of the elderly village midwife and herbalist. Sari is "different," and that's enough to make her disliked and feared by almost everyone in the village, except her fiance, Ferenc. But when World War I breaks out and most of the young men in the village leave for the front, Sari becomes closer to the other women in the village, who begin to include her in their gossip and rituals. Most of the women seem content to be temporarily rid of their brutish boyfriends and husbands, and when a prisoner-of-war camp for Italian officers is set up nearby, they are only too happy to find excuses to work at the camp, leading inevitably to flirting and affairs between the local women and the officers, despite the language gap. Even Sari is not immune to the Italians' charms, and soon is involved in a passionate affair with an Italian professor who stimulates her mind as well as her senses. When the local men begin to return at the end of the war, including Sari's fiance, Ferenc, the Hungarian men's suspicions are aroused, and violence ensues. Sari fears for her life, but ever resourceful, she comes up with a clever and devious plan to get rid of Ferenc. It's not long before other women in the village want her help to rid themselves of their own husbands. Will the village women get away with their sinister plans? Amazingly, this novel is based on a true story the author discovered in a "true crime" book. I found the story riveting, as did my teenage daughter. I think teenage girls will be drawn to the teenaged protagonist, as well as to the love, passion, and crime central to the story. It's a tale that's hard to forget, somehow mixing elements of fairy tale (the witch-like girl in the small village) and a more contemporary-feeling revenge story in a satisfying blend that will keep you up at night thinking about it. I'm wondering if it's been optioned for the movies--I could definitely see it as a great thriller! 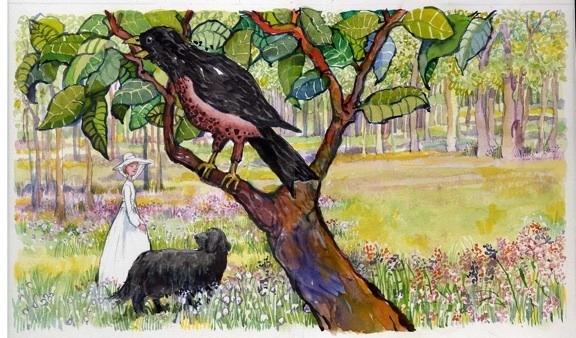 In this historical picture book published in 2011, the 100th anniversary of the establishment of women's suffrage in California, author Claire Rudolf Murphy imagines the girlhood of Bessie Keith Pond, a real ten-year old girl who lived in Berkeley, California in 1896, the first year that a referendum on women's suffrage was on the California ballot. All Bessie wants is to go hiking with her Papa and her brothers, but when they leave without her, she gets a chance to meet a famous guest at her home--the elderly Susan B. Anthony. "Aunt Susan," as she's called by all the women in attendance at their tea, is in California for a women's suffrage rally in San Francisco. Bessie's so inspired by Susan B. Anthony's speech that she recruits her friend Rita to come with her to work at suffrage headquarters, writing letters, licking envelopes, and painting posters. Bessie soon learns that there's lots of things besides hiking that girls aren't allowed to do. Although suffrage did not succeed in that referendum, the book ends on a hopeful note as Bessie's Mama learns to ride a bicycle--a symbol of freedom for women, and Papa decides to take Bessie hiking after all. Illustrator Stacy Schuett's vibrant illustrations, rendered in gouache on watercolor paper, greatly enhance the narrative. The book is supplemented with extensive back matter, including an author's note, further information on Bessie Keith Pond, the California suffrage campaign, Susan B. Anthony, and suffrage history. A bibliography of further resources for young readers, including web resources, is also included. The endpapers are illustrated with a variety of historical newspaper clippings and other historic materials which readers can peruse. 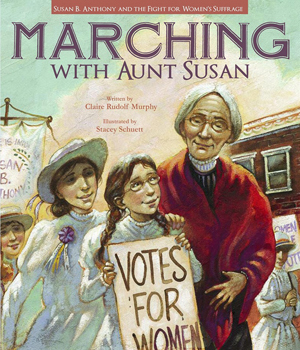 Marching with Aunt Susan is a perfect book to share during Women's History Month, and was honored by the Amelia Bloomer Project as a 2012 pick on their recommended feminist literature for children list. To learn more about Marching with Aunt Susan, check out Claire Rudolf Murphy's post on Kidllit Celebrates Women's History Month. about "My Hero, Susan B. Anthony." Giveaway: You can also enter to win a copy of this book, and a prize pack of a number of other new titles for Women's History Month, by leaving a comment on any post on that site! Although I haven't read any of Zora Neale Hurston's original work, I was fascinated by this upcoming biography for young people of the celebrated African-American novelist of the Harlem Renaissance. Written by veteran nonfiction writer Dennis Fradin (he's published over 200 nonfiction books!) and his wife Judith, this book tells the story of an extraordinary woman who knew she was special from an early age. She grew up in the unique all-black town of Eatonville, Florida, where she was unaware of racism and grew up so self-confident that she believed the moon followed her wherever she went. From her childhood on, she loved to tell stories, and had a wonderful imagination. While a student at Howard University, Zora was accepted into their literary group and had her first work published. From the beginning, her work featured realistic dialogue, with the characters speaking in a dialect modelled on the real people she had grown up with. When she was in her thirties, she moved to New York City to try to make it as an author, with $1.50 in her pocket, "no job, no friends, and a lot of hope." There she befriended important writers such as Langston Hughes and became recognized for her work as an anthropologist as well as a writer. 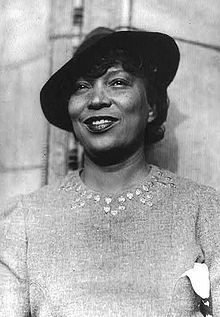 The book points out that despite the recognition she received during her lifetime for her books and folklore work, Zora remained poor, and even had to take a variety of "day jobs," including work as a librarian, maid, personal assistant, waitress, college drama teacher and even as a Hollywood script consultant. By the end of her life in 1960, all her works were out of print; in the 1970's, they were rediscovered by a new generation of African-American writers, including Alice Walker, and her books have now been republished. In fact her most popular work, Their Eyes Were Watching God, has sold more than 5 million copies, and is used in many high schools as part of the curriculum, as well as being made into a movie produced by Oprah Winfrey and starring Halle Berry. This is a great biography to recommend for kids from 9-14 years old, and provides plenty of information for those school biography reports. Her incredibly varied life, in which she achieved some fame, but little financial success, is a remarkable testament to her persistance and her spirit, and the book does an excellent job of portraying the different sides of her life, both the complicated personal (she was married and divorced three times) and professional aspects aspects of her story. 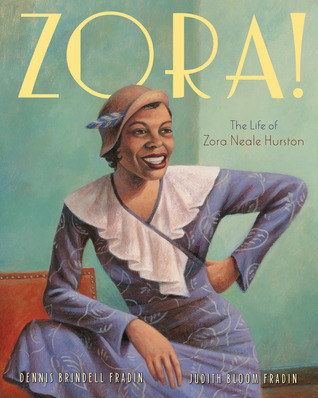 The book is abundantly illustrated and also includes many quotes from Zora Neale Hurston's own writings, which give the text a real flavor of the author particularly for young people who may not read her books until high school. Back matter includes an excerpt from one of her folktale collections, a timeline, source notes, and a bibliography. 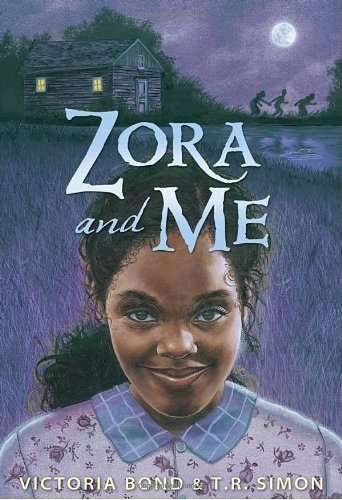 For more on Nora Zeale Hurston's childhood in Eatonville, I recommend Zora and Me, a middle-grade mystery novel by Victoria Bond and T. R. Simon (Candlewick, 2010), which imagines Zora's childhood in Eatonville from the point of view of her best friend, Carrie. I'm a bit embarrassed to admit I've never been a big fan of Emily Dickinson--I've always found her poetry challenging and thought of her as the reclusive, dour-looking New England spinster that we've all seen in photographs. 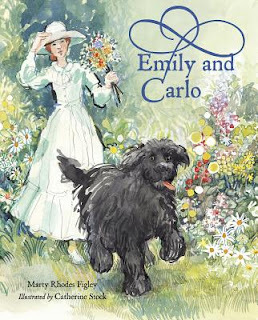 To learn more about Emily and Carlo, check out Marty Rhodes Figley's post on Kidlit Celebrates Women's History Month. Would you like to win a copy of this book along with a prize pack of other new women's history picture books? Leave a comment on Marty Rhodes Figley's post or any other on Kidlit Celebrates Women's History Month. Each comment you leave gives you an entry to win! Nearly all little girls love to play dress-up. When I was a little girl I remember loving to dress up in my grandmothers' clothes when I would visit them. Today's children are more likely to have a collection of dress-up clothes or old Halloween costumes to play with. But don't despair--despite the mammoth Disney marketing engine, little girls are not required to dress up as fairies or Disney princesses! "I used to only play princess/ until Mommy showed me pictures/ and told me stories of real, great women. Now dressing up is an adventure/ when, every day of the week,/ I am a daring new dame!" Each day of the week, our heroine dresses up as a different famous woman, including Amelia, First Lady of Flight, Ella, Queen of Jazz, Marie, Star-Studded Scientist, and Frida, Prized Painter. She even marches in a parade with her flag as Elizabeth, Super Suffragist! The colorful and whimsical illustrations show a child dressed up in costumes anyone could easily copy at home, and best of all, the little girl is even depicted putting away all her props and costumes (The clean-up song from Barney went through my head at that point in the story!) The story concludes with an inspirational message, "And when I'm older, I hope/ to have my own outstanding outfit,/so that little girls will sport costumes of me!" Back matter includes brief biographies of the great women mentioned in the text, as well as a short list of picture books on some of the women in the book. Endpapers offer paper-doll costumes and a paper doll, which could be color copied to be played with without destroying the book. This is a delightful alternative to the plethora of princess books being published these days, and a great choice for preschoolers or early elementary school students. 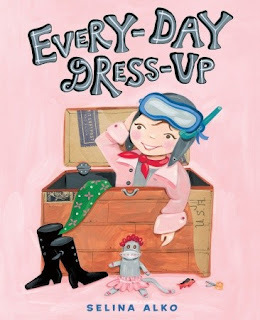 For more on the inspiration for Every-Day Dress-up, see Selina's post at Kidlit Celebrates Women's History Month. You can also enter to win a copy of this book, and a number of other new titles for Women's History Month, by leaving a comment after her post on that site! 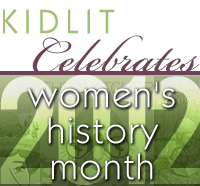 Kidlit Celebrates Women's History Month! It's March, and that means it's time for our second annual Kidlit Celebrates Women's History month blog. This year we're having another outstanding group of children's authors and bloggers posting about different aspects related to children's books and women's history, including five authors whose books were recognized on this year's Amelia Bloomer Project, which recommends feminist literature for children. Sign up to "follow" the blog or to get the blog postings by e-mail in order not to miss a single post! We will also be having a giveaway of five terrific new picture books for women's history month (four of which will be featured on the blog); each time you comment on a post on the Kidlit Celebrates Women's History Month blog you will be entered to win!